Think of carcassonne as a German enclave, similar to Asterix in his battles with the Romans! Given the oblong size of my dining table, I think I will see if I can make a USA mainland map. Should be big enough for base game plus a couple of expansions at least. Thank you for the heads-up. As soon as the English rules are released by Cundco.de, I'll check any necessary updates to the current page. I know I said I didn't want to buy it but in the end I did it ... and last night I tried it! So... about the rule of playing with 2 more followers, I think it's right because there is a strong possibility to place followers on cities or streets that, if stretched near the edges, remain incomplete. Regarding the starting points, it is not a bad idea to have 2 or 3 of them ... As further starting tiles I used the 2 SpielDoch (finally an interesting use of the 2 tiles!). I played with the basic game, the festival, the 5 Spiel promo tiles, the flying machines and the new German castles (104 tiles). I chose these expansions following the suggestions of the rules of not using rules and followers of expansions. In fact the boundary of the map limits the placement of tiles and it may happen that you have to discard tiles that cannot be placed more often, especially towards the end of the game (and it can hppen more if you add other tiles to the game). The rush to have the cities that give the additional bonuses was interesting. The map is really well printed. Once the corners are fixed with weights it remains well spread on the table without undulations. In short ... 8 € well spent! Sure, they could make France! but I hope that they actually manage to sell enough to launch other maps (even if I already imagine they will never do Italy ). I think that Cundco have found an issue that seems to be costing them a bit.. 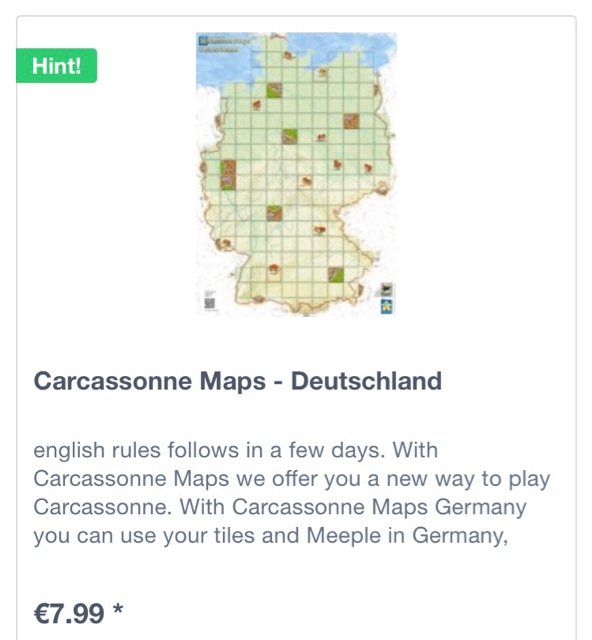 They now state on the website that the Carcassonne Maps can only be ordered on their own, in a maximum of 5. I guess that the shipping is more costly for them if they need to combine it with other products. When i ordered mine it was possible to combine, and i got it in a rectangular box with a smaller box taped to it with the other products. The rules on WICA are now based on the English rules release by Cundco. BTW, the rules use "emblems" instead of "coats of arms". Has anyone seen this on any other New Edition rules? Thanks!! I'm really interested in the next versions of the game using expansions etc... I think that the 8th and 9th meeple should be mayor and car? Hahahaha! I was hoping they had fixed some of their high shipping cost problems with their new solution, but nope! If anything, the shipping price has gone up. €28.95 for a €7.99 piece of A1 paper. Yup, still going to pass on that. Anybody live in Germany (or an equally cheap-to-ship country) who is willing to repackage this for me? I don't mind creases on my map. It's got to be stored somehow, after all. I agree. Would really like to get this but the shipping to the US makes it too expensive. If it was group shipped with 5 in total it may end up cheap enough (for each) but then the other 4 would have to be sent on with an additional shipping cost.